This baby that is growing in my stomach must love peaches. I have had the craziest peach cravings since I discovered the juiciest sweetest organic peaches I have ever eaten at my local fruit market. They are so juicy that you have to eat them while holding a paper towel under your chin to catch all the juice. The best part is they are $1.79 a lb and dropping in price every week. Over the last couple weeks I must have eaten 4-5 peaches a day, most of them at night and, although I could never get sick of raw peaches, I have been wondering what else I might be able to make with them. After a quick internet search I found what I was looking for. 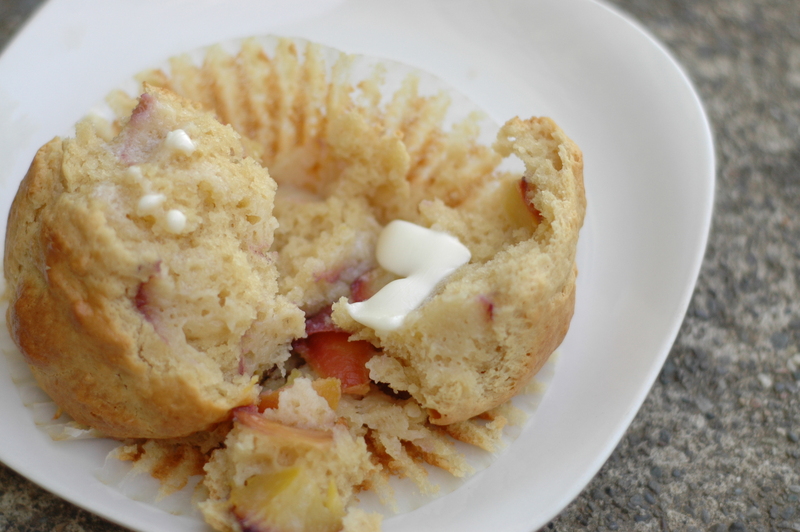 So while Brae read at the table and Tom took his Sunday nap I spent a quiet hour in the kitchen making and photographing these moist fruity muffins. While gathering my ingredients I realized we were completely out of the required granulated sugar, so I substituted brown sugar. I knew that the extra rich caramel flavors would pair nicely with the sweetness of a peach, something akin to a peach crumble. What I ended up with is an extra moist muffin stuffed with warm nuggets of peach. Little sweet surprises in every bite. 2. Line a 12 cup muffin tin (or 6 cup jumbo muffin tin) with paper muffin liners. 3. Melt butter in a small skillet on low heat and set aside to cool. Mix flour, baking powder, and salt in medium bowl. 4. 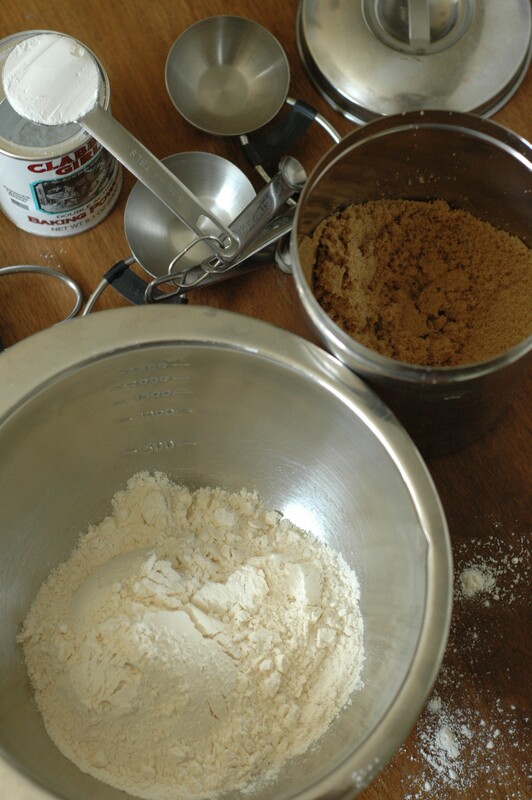 In another bowl whisk together the egg and brown sugar until its thick and well mixed. While whisking, slowly pour in the milk and butter. Add sour cream and stir to completely combine. 5. 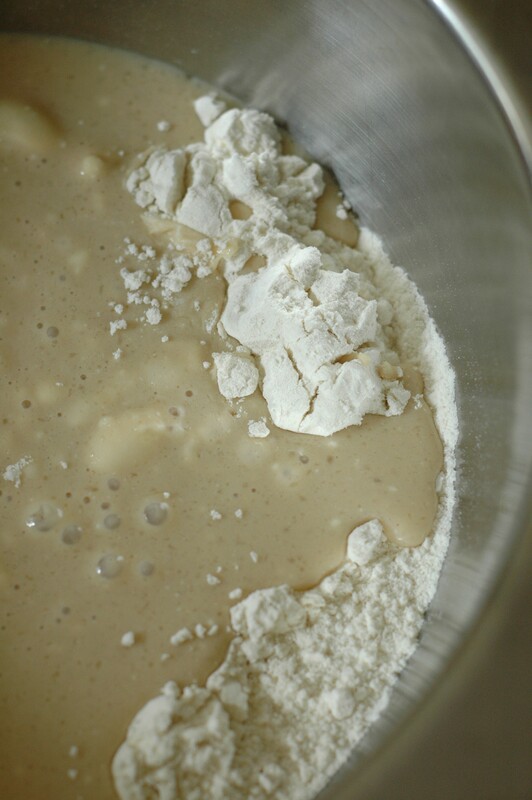 Fold the egg mixture into the flour mixture until almost mixed. 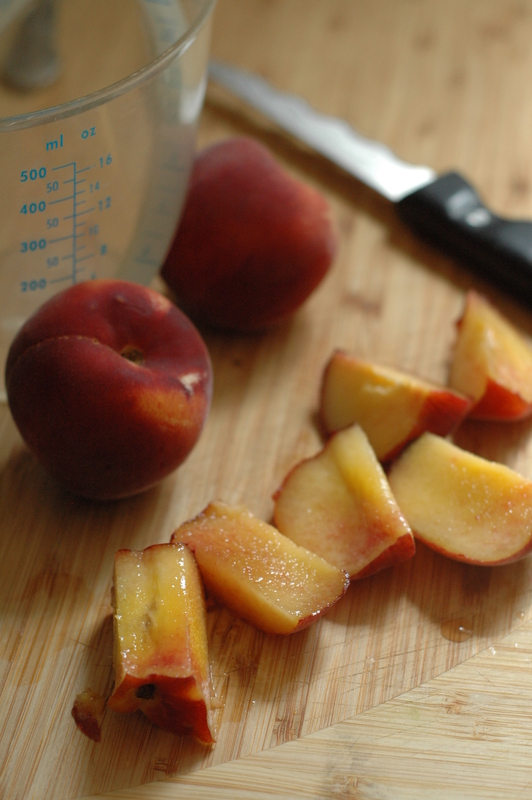 Add chopped peaches and mix until ingredients are just combined and the peaches are well-distributed. Do not overmix. 6. Fill muffin cups 3/4 full. Bake for 35 minutes or until a toothpick comes out clean. 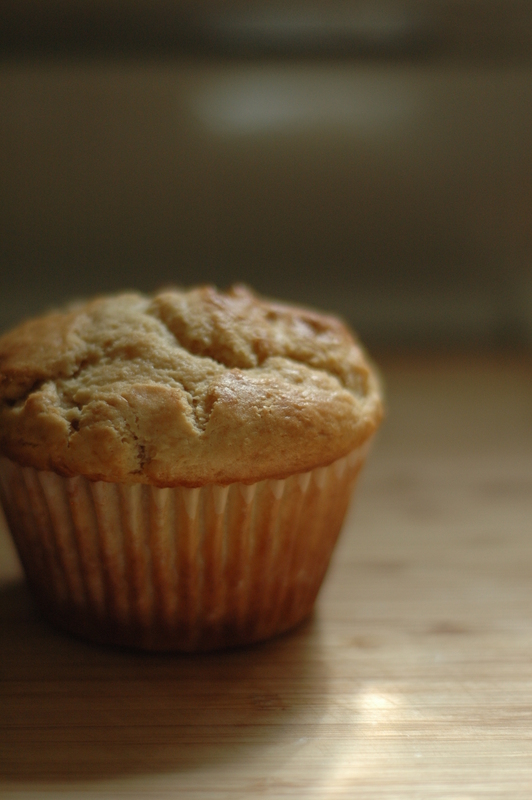 Take muffins out of the tin and let cool. 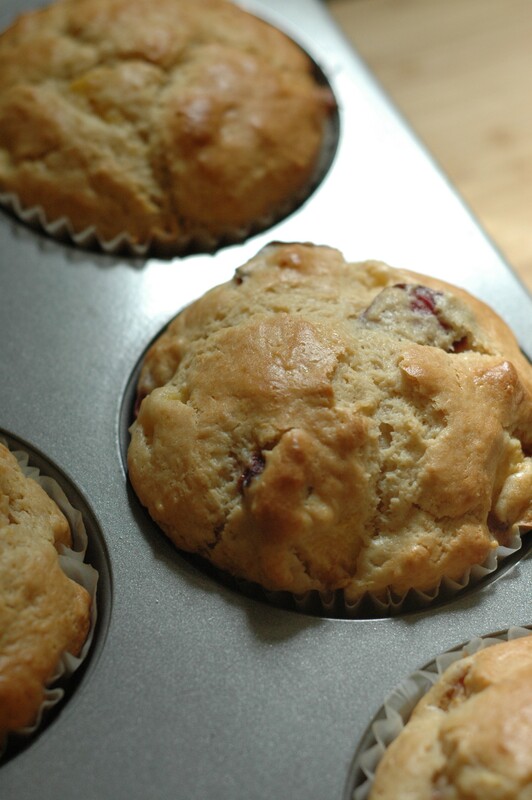 If you did not use liners then let the muffins cool in the tins for 10 minutes before removing. 7. Serve immediately or store in an airtight container for up to 2 days. What do you think about that flat cooktop? I really, really *hate* mine…it feels like all I do is keep it clean. Ironic. I’ve come to the conclusion that those cooktops are for people who cook less often — but, I only know one other person who feels this way, and clearly, those flat tops are popular. Still, I admit I’ve used it as extra counter space when the burners are off…..so, maybe that makes up for all the extra fiddling. I hate it! I wish I had a gas stove again but landlords don’t seem to trust their renters with gas stoves :).